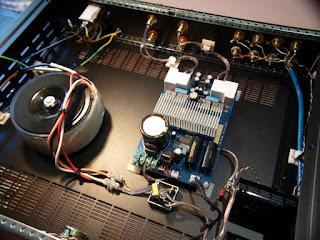 Yet another Class D Tripath amp using the hifimediy Class D 180W module V1.3. This one is setup for a 4ohm load. Lower PS voltage but higher current - 13A. I added 16000uf of smoothing caps and 40A rec bridge. Bipass caps keep the bridge and electros quiet. 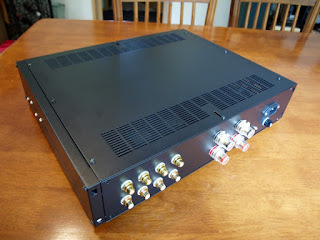 Four rear inputs with very heavy duty speaker terminals. All switches up front with a small power switch for each input. A Cat5 solid core cable brings the input to the selection switches. The pot is a 24 step stepper and with 4oz brass, gold plated knob. An IEC socket has a power filter and the enclosure is earthed and fused. 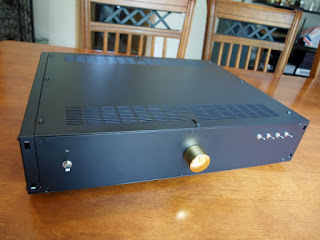 The enclosure is a 19" 2U rack mount in a black stipple. Really heavy bass with a very smooth sound, feels effortless. Dead quiet operation. The module has much current and voltage protection plus crowbar speaker protection. This was a commission job. I commisioned this Integrated D Class as my entry into this area. These photos were taken before the Retro Thermionic "Succint" name badge was added. It sits in my rack 'hiding' in understated black with gold highlights and soft amber 'on' light. It's hard to believe such an unassuming piece is the centre of the action. Effortless accurate clarity is the hallmark. Balanced across the range with a firm grip on the bass when needed. The clarity does reveal any character the source has. A very successful build and based on your requirements. Just reall glad you like it. Built a simpler one for myself. Enjoy and thanks for the nice comments.